I was searching the company library for latest IT journals and couldn’t find it. Somehow I was not interested in all those financial books which once I have studied more than twice. Then I saw the book which many recommended, I knew what it was about but then I somehow wanted to honour the recommendations. My last attempt to complete a book was with ‘Da Vinci Code” which wasnâ€™t a success but surely I wanted to give myself one more chance with â€œThe Monk who sold his Ferrariâ€ by Robin.S.Sharma. After covering the half way I started experiencing its applicative power. It wanted me to look back and analyse the past moments. There were more changes to me in past 2 years than gaining few pounds. Last 2 years I have worked and only worked though I enjoyed every bit of it. Luckily I enjoyed what I did but then even after that the pressure was catching me faster than I expected. More than money the creative world attracted me and motivated to work and learn things faster than others. Handling team was never an easy job and esp. when almost everyone is as fresh as me. The life where almost 18 hrs a day I was in front of my stupid computer or the stupid computer(s) were in front of me. It is surely an awakening call that doesn’t mean I will stop working, I will continue to work smarter but not at an expense of my self. I need to redefine my goals (both shorter and longer ones). Atleast 5 mins of meditation (if possible in morning). Better organization of task and better delegation of work. At least 5 (if not 6) hrs of sleep everyday. 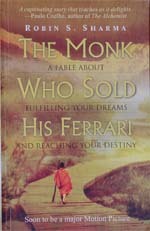 â€œThe Monk who sold his Ferrari” by Robin.S.Sharma is a wonderful and inspirational book After some real long time a book has inspired me to such an extent. IMO At least a must read for every IT soul. Also I am planning to buy “Mega Living” by the same author (another recommended one).